Sometimes my music listening – Mouse on Mars, Woob, Aleksi Perälä – starts with the tap of a smartphone screen. Other times, listening to records from David Bowie, The Hold Steady and Kitchens of Distinction begins with the carefully lowering of a tonearm. Whatever the source kick-off these past two months, the next step has invariably meant carefully pulling a Grado headphone extension cord across the floor, from Mytek Brooklyn+ to my favourite chair, for a heavy dose of headphone listening: world off, music on. I live in a NeuBau (new building) – a Berlin rarity. Were music to disturb neighbours, loudspeaker sounds would have to penetrate thick concrete floors and walls. An AltBau (old building) neighbour might not be so fortunate — large houses carved into flats with nary a cent given over to sound insulation between floors make headphone listening damn near mandatory. Moreover, when one’s living space serves double duty as a loudspeaker listening space, room treatments for many are financially out of reach and/or aesthetically impractical. 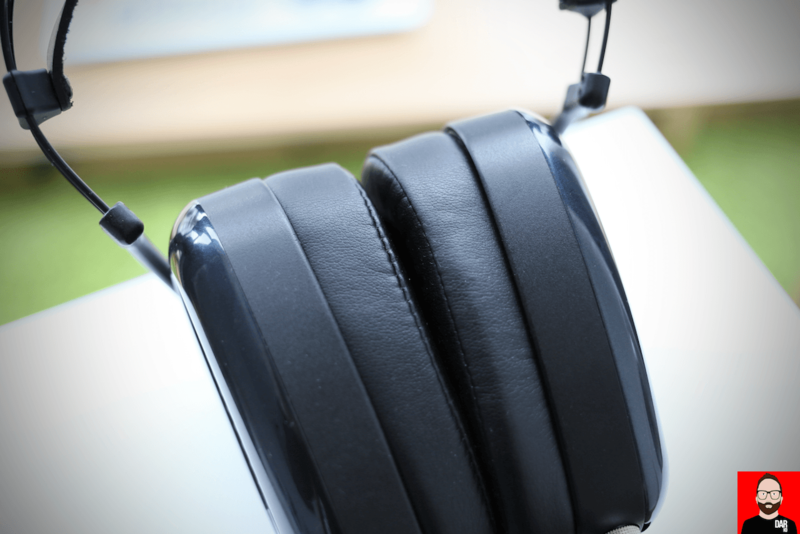 Headphones sidestep the issue of room acoustics by removing it completely. Relaxing in my 6m x 5m lounge/listening room headphones consistently give me better sound quality for fewer dollars. Conversely, headphones privatise our enjoyment of music for a further erosion of (increasingly rare) shared experiences where music otherwise heard together via loudspeakers acts as social glue. Our desire for shared music might explain why live shows are on the up and up. When the Mytek Brooklyn+ DAC isn’t piping tunes from its rear panelled XLR outputs to a pair of Genelec 8341 ‘The Ones’, one of its two 6.4mm front panel headphone sockets deals to a pair of MrSpeakers’ ÆON Flow Open headphones (US$799). 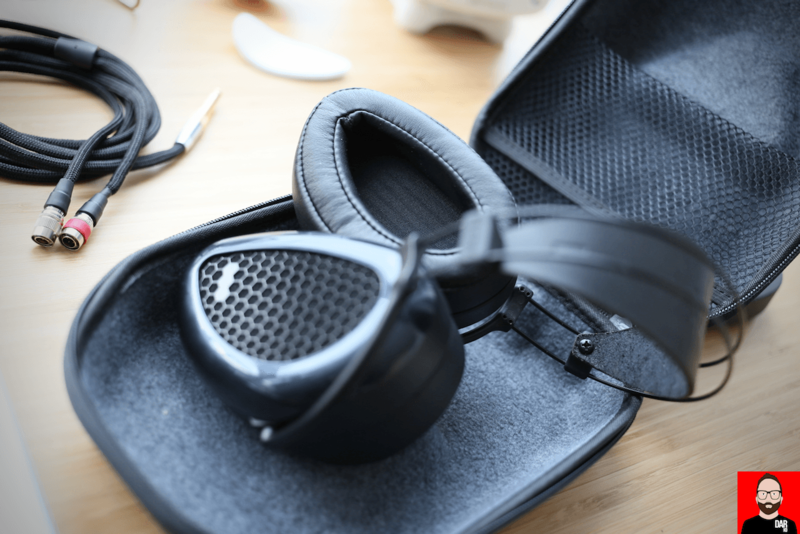 Their teardrop-shaped circumaural earcups more closely trace the ovoidal outline of the ear to follow the upper jawline lower than the more rounded AudioQuest NightOwl Carbon (US$699). With a clamp pressure that translates to a snugger fit, I find myself more cognisant of the ÆON’s presence than I do when wearing the AudioQuest. This makes the ÆON more conducive to reclining on a mound of cushions on the couch but when forcing the upstairs office/lounge chair to tilt hard. In striking the balance between sideways clamp force and comfort, the ÆON get it just right. Instead of designing them to feel ‘invisible’, the best example of which is the Sennheiser HD800/S, comfort maximisation is achieved by going in the opposite direction: allowing the ÆON Flow Open to register their physical presence but utilising 1) a leather headband to distribute the 321g weight throughout the surrounding exoskeleton and 2) super chunky faux-leather pads to cushion – nay treat – the ears. It’s an approach that sees the ÆON Flow Open pull lamup a tight second to the AudioQuest on comfort factor, making it easier to sink into the couch and into late night listening. If headphone comfort were the lean back and slow exhale of a Lambchop album, the NightOwl Carbon would be Is A Woman (more relaxed) and the ÆON Nixon. To (over)state the obvious: just because The Rakes’ indie rock or The Secret Machines’ stadium space rock set the pulse racing to connote nervous discomfort doesn’t mean our headphones have to. This is not MrSpeakers’ first rodeo. 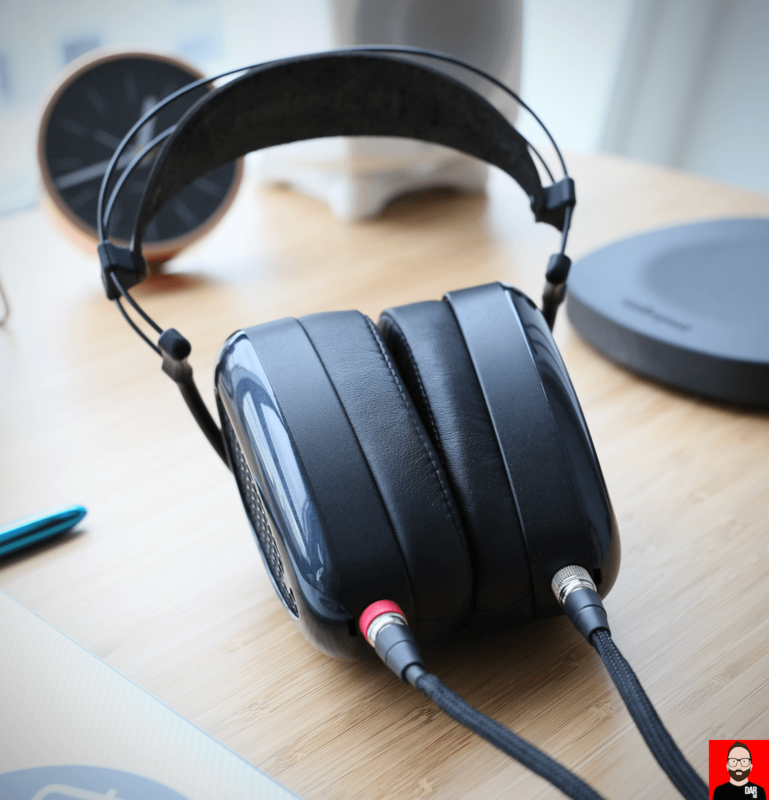 In a fast five years, company founder and Burning Man enthusiast Dan Clark has gone from modding Fostex T50RP planars (Mad Dog) to rehousing their drivers in 3D-printed cups (Alpha Dog) to developing his own planar (Alpha Prime, Ether) to, more recently, announcing the upcoming availability of his first electrostatic model, the US$2999 Voce. 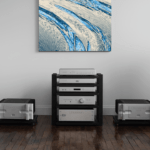 The 4x more affordable ÆON Flow Open were launched at RMAF in October 2017 and were preceded by a closed variant first heard by yours truly at Munich High-End some six months earlier. Both ÆON versions utilise the same V-Planar driver tech introduced by the Alpha Prime and carried over to the Ether: according the Clark, the driver isn’t flat but concertina-d for “improved pistonic motion”. As to why the magnets sit on the ear side (and not the outermost side) of the driver: “It sounded better that way.” ‘Flow’? That F-word refers to the waveguides implemented by Clark to reduce turbulence as air flow between the magnets. Sound is air movement and turbulence equals distortion. Headphones are audio clothing. We wear ‘em. At home, outward appearance matters less than out in the street where, for this listener, slimmer/trimmer closed-back wireless Bluetooth over-ears and IEMs take over. The ÆON Flow Open don’t threaten the B&W PX or Sony MDR-1000X on travel companionship. And yet that hinge-less wireframe headband isn’t the fragile concern we might assume it to be. Made of Nitinol, a shape memory alloy, it will return to its pre-deformed shape when heated. Don’t reach for that hair dryer just yet. It’s exceedingly well behaved. Throughout the course of three weeks’ driver burn-in I’d try to outwit the memory metal’s claims with some forceful twists and turns…only to see it spring back to its original U-shape each and every time. The only permanent damage was to my presumption that Nitinol’s limits as a shape shifter could easily be found out. Detach the ‘DUM’ cable’s 4-pin connectors to more easily wrap the painted earshells and the ÆON could easily ride in a backpack. No need though. 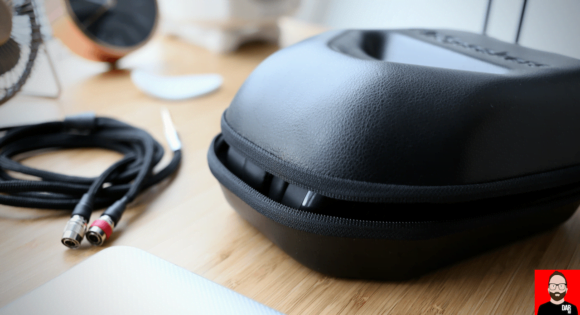 The supplied clamshell case delivers greater protection from hard knocks than AudioQuest’s larger, softer-sided carrycase (that doubles as retail packaging) ever could. 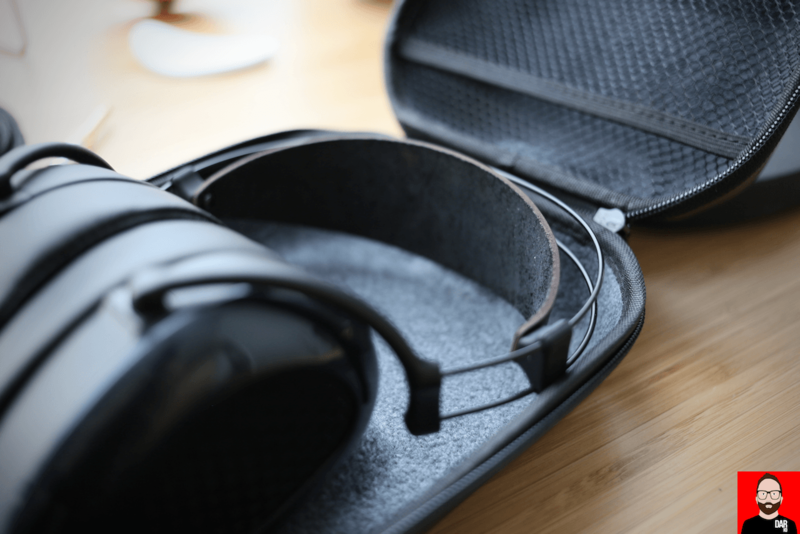 Doubly so the travel pouch that Audeze ship with their Sine/DX or B&W with their PX. On a trip to Portugal the ÆON Flow Open’s carry case proved small enough to fit in carry-on baggage for the outbound flight but sturdy enough to withstand a potentially rougher ride through checked baggage handling for the return. Once again, MrSpeakers get it just right. That doesn’t mean the ÆON Flow Open can handle in-flight playback. Their open-backed design sees music radiates outwards (annoying for others) and cabin noise mixe with the music (annoying for you). Furthermore, these MrSpeakers ‘phones call for a little more go juice than that provided by the average smartphone. Robust SPLs arrive at around 80% on an iPhone 6S Plus. Higher with older recordings. The Xiaomi Mi A1 must go higher still, more often than not closing in on 100%. Besides, anything larger than pseudo in-line solutions like AudioQuest’s DragonFly Red/Black whilst in motion are plain annoying: how does one pocket a rubber-strapped two-fer without crushing cable connectors; and how does one deal with incoming phone calls? The ÆON Flow Open are for listening once settled at a destination. Hard-wired headphones that play at home and away (but rarely in between). 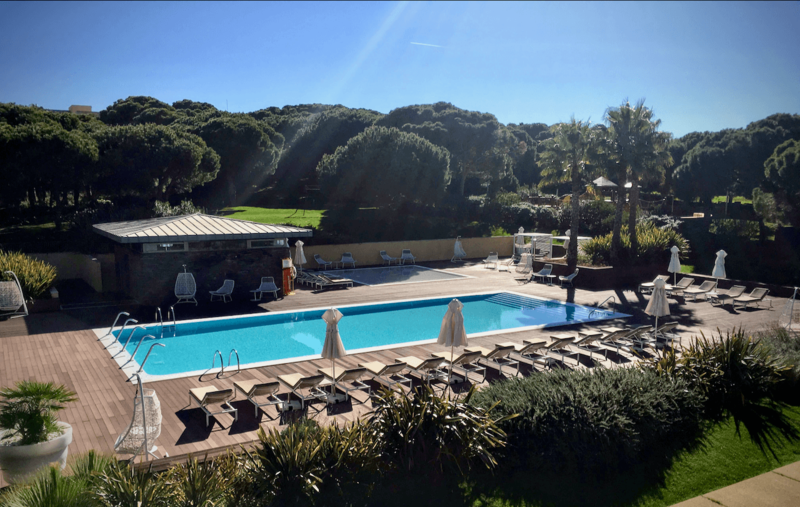 Despite offering healthy doses of winter sun for north-eastern Europeans, Portugal’s Algarve is almost devoid of people in early January. Local restaurants and convenience stores close up for a few weeks. Hotels are often deserted. For this reviewer on the road, seeing no-one around to be disturbed by a headphone’s sound leakage, a Chord Mojo and iFi micro iDSD Black Label took turns to power the ÆON Flow Open. Sometimes I listened in the lobby, but mostly I made use of Tidal Hifi streaming once poolside. Let’s make abundantly clear the ÆON Flow Open’s most aurally satisfying quality, one that runs counter to expectations for most open-backed headphones: their take on the The Field’s pulsing The Follower doesn’t have the open field spaciousness of the costlier Ether Open, nor the double espresso caffeination and X-ray specs of the Sennheiser HD800S. That makes the ÆON Flow Open the better suited of the three to ensuring piss poor 80s indie recordings like the JAMC’s “Never Understand” or Throwing Muses’ “Counting Backwards” aren’t robbed of their subjective enjoyment factor in the name of audible truth. Really, really nice..
For fans of such music, the ÆON Flow Open’s intimacy and slightly reluctant lower treble simultaneously pave the way for the Chord Mojo’s greater air bite and incision to cut through (and around) the ÆON Flow Open’s meatier-than-average midrange. The Mojo adds a little citrus to Clark’s rich chocolate voicing. 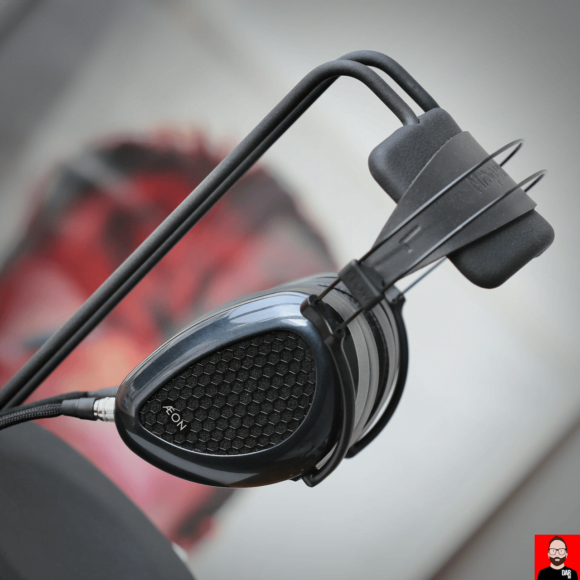 More so than the Sennheiser HD800S, the ÆON Flow Open give us vocals we could chew on. Two of this reviewer’s favourite transportable headphones below a thousand bucks are the Audeze Sine DX – open, on-ear, planar-magnetic – and the AudioQuest NightOwl Carbon – closed, over ear, dynamic. Different topologies top to bottom, they could not sound more different. The Audeze play it direct, clean, snappy and, with some music, uptight. By way of contrast, the AudioQuest come on as warm-blooded, easeful, dynamic, intimate, and, with some music, a little hooded up top. Tales of Us’ Renaissance Mix Collection and Redshape’s Square – both operating in the middle ground between house and techno – tell us that the MrSpeakers’ planar hits with effectively the same amount of 4-4 thump as the Audeze but can’t quite match it on bassline textural reveal. 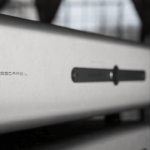 On electronic music’s microdynamic twists, the ÆON Flow Open and Sine DX are equally zippy but the former also maintain some degree of the NightOwn Carbon’s signature sense of ease – very pleasing. Moving over to the modern American folk of Bonnie ‘Prince’ Billy’s I See A Darkness, we hear the ÆON Flow Open casts music through more humid air than the Audeze but not as thick as the AudioQuest’s warmer blood and its faster forgiveness of lesser source material. In other words, the MrSpeakers’ give us the Goldilocks treatment: not too big, not too small — not too loose, not too firm — not too dark, not too bright — not too warm, not too cold — not too hard; not too soft. The ÆON Flow Open headphone looks, feels and sounds just right.